An impressive Dutch oak and rosewood cupboard formally also as a 'Kast' or 'Kas'. Dating from the late 17th century, this cupboard would have originally been used for storing handmade cloth, bedding, and blankets. 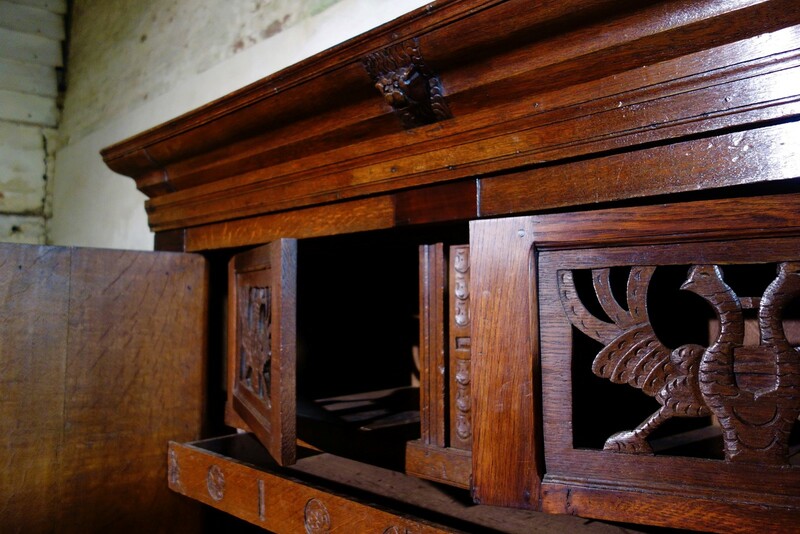 The interior of this cupboard features two shelves with an internal full-length thin drawer with a further double doored cupboard located above - demonstrating exceptional hand-carved detailing to both the front of the doors and drawer in the form of a pair of birds and circular decorations. This Kast demonstrates two extremely thick and well constructed double doors, creating a great sense of depth by the positioning of the angular molded decoration. The frontage of this cupboard features further repetitive rectangular molded forms which creates a symmetrical and aesthetically pleasing design throughout. This cupboard is framed by a molded base and cornice, the base features a full-length drawer, offering additional storage while the overhung cornice demonstrated molded and simple caved decoration in the form of a face.